« « « Interested in Waco's colorful past? Then join the Waco History project and help us share the stories. 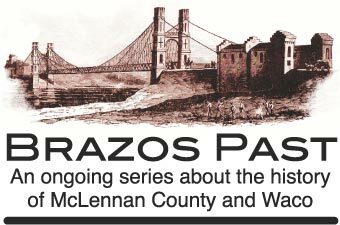 The Waco History Project is a joint effort of the Waco community to provide a resource base on Waco history and to generate curricula and other learning resources for teaching local history in the Waco and surrounding communities. The Waco History Project (WHP) will connect people of all ages to the community by telling the story of Waco's diverse past. Readers of the Waco Tribune-Herald have seen Waco History Project events, sometimes dovetailing with its Brazos Past features. We’ve explored areas like Sandtown, Calle Dos (Two Street), one-time suburb White City (it’s not what the name might imply), and long-lost Bridge Street, where black-owned businesses predominated. 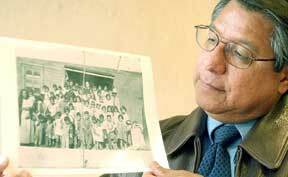 A major thrust is imparting local history with Waco children. The Waco Independent School District has been intimately involved. One of our hopes is that not only will students refer to this site, but that student work about Waco history will also accumulate on the site. Check out “Student Corner” and get a taste. But that’s all it is right now — a taste. There’s so much more to share and so much local history for students and citizens of Waco to explore. The Waco History Project will present “A Coming Home Celebration and Remembrance” to honor Waco-area veterans of the Korean War, especially its POWs and the missing-in-action, at 6 p.m. July 27 at VFW Post 6008 in Hewitt. The free, public presentation takes place at 725 Sun Valley Blvd., and will feature stories of grace and courage from Sgt. Julian Ramon, Cpl. Isaac Martinez, Cpl Abraham Hernandez and Sgt. Jack Goodwin -- all Central Texans U.S. Army veterans who survived the horrors of Communist captivity during the conflict which ended July 27, 1953. The late Oscar DuConge, Waco's first African-American mayor, and his wife Kitty, visit with former Oral History Institute director Thomas Charlton in 1973. Visit the Oral History page for stories and links to the Baylor University Oral History Dept. The Forsgards meet The Wacos — audio slide show. Waco Post Cards - slide show. Moments in Time "The Bus Ride"
Places in Time "Are You From Sandtown?" "The Square From Every Corner"
You can remember either the Raleigh or the Roosevelt Hotel. Slaves in the Shadows of the Past: The Institution Was No Stranger to the Waco Area in the Mid-1800s. Although slavery arrived much later in Texas than it did in many other Southern states, the institution was certainly no stranger in Waco and Central Texas in the mid-1800s. 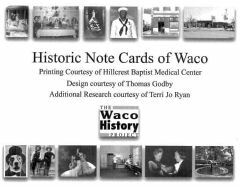 Historic Note Cards of Waco can be purchased from Jennifer Warren by calling 254-366-2442 or emailing annabelltoo@yahoo.com.